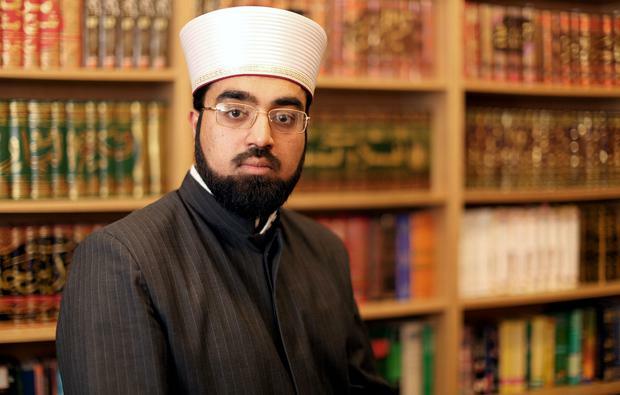 MOSQUES across Ireland will be increasing their security following the New Zealand terror attack, a senior Muslim cleric has said. In total, 49 people were killed and 20 injured when a gunman opened fire at two mosques in the city of Christchurch yesterday. In response, gardai said local community officers would be attending yesterday’s prayer services at places of worship and “making themselves available to those communities”. The move was welcomed by Shaykh Dr Umar al-Qadri, Imam of the Dublin-based Islamic Centre of Ireland, who said it will give them an opportunity to discuss security measures at mosques. 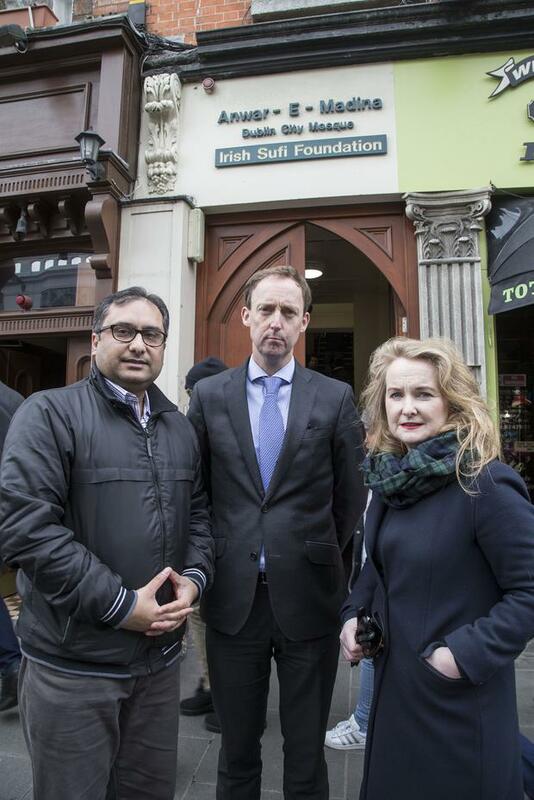 Barry Andrews (centre) pictured with Mary Fitzpatrick and Imran Khurshid at The Dublin City Mosque, Talbot St.
“I think generally speaking overall, mosques will increase security in Ireland. We don’t expect an attack but lone wolf attacks can happen anywhere… so we will have to be vigilant unfortunately,” he said. “Anyone who would spread a hate narrative or extremist views as a populist view is someone who has contributed to this attack, so in that regard there has to be a clampdown on anti-immigration rhetoric, anti-Muslim rhetoric and any rhetoric against communities,” he added. Meanwhile, local and national representatives have expressed a message of support and solidarity with Muslims in a Dublin mosque. As hundreds of Dublin-based Muslims gathered for Friday prayers at Dublin City Mosque, on Talbot Street in the north inner city, Fianna Fail local election candidate Imran Khurshid invited party stalwarts Barry Andrews and Mary Fitzpatrick to address the congregation. 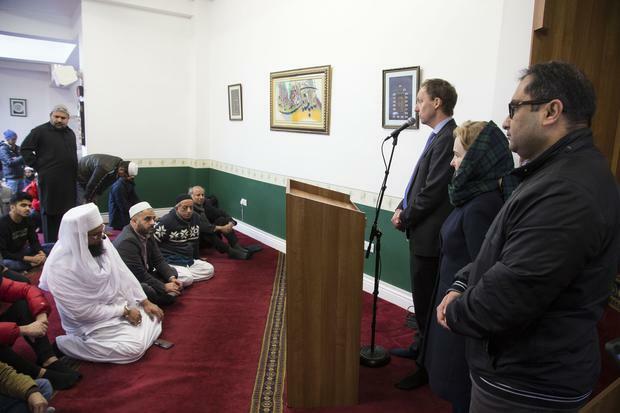 Barry Andrews pictured with Mary Fitzpatrick and Imran Khurshid addressing attendee’s during Friday prayers at The Dublin City Mosque, Talbot St.
“I am here today to express my extreme sorrow for the people of New Zealand, the Muslim community of New Zealand, and to express my genuine deep solidarity with the Muslim community here in Dublin,” said Mr Andrews. “I think, like everybody, I was shocked at what I saw this morning in the media and very sorrowful. “As a father of three children, you cannot but feel a tremendous sense of pain at the loss that so many families are feeling today. “I want to come here today to express on behalf of all of the people of Dublin that sense of solidarity and feeling for our fellow men, women and children, wherever they may be, or whatever colour or creed. That is the strong values of this country, values of welcome. Ms Fitzpatrick also thanked the Muslim community for her invitation to address them during their moment of prayer. “We have come here today to share with you, to comfort with you, to try and find understanding and acceptance, and to reject the hatred and division and violence,” she told the gathering of around 300. Some people attending prayer had earlier expressed their fears that there might be a danger of trouble at the mosque if the New Zealand murders were part of a global attack. “I was a bit reluctant when I was coming. I was thinking there might be some problems all over the globe. I was a bit worried about it,” said Mohammad Zarad. Bakary Ceesay said prayers were said for the victims of Christchurch at an earlier prayer meeting. “It wouldn’t stop me coming here today but there are crazy people all over the world,” he said. Mr Khurshid said that he does not want to spread any message other than peace. “My motivation in bringing Barry and Mary here today is to bring people together. The city belongs to everyone,” he told Independent.ie.